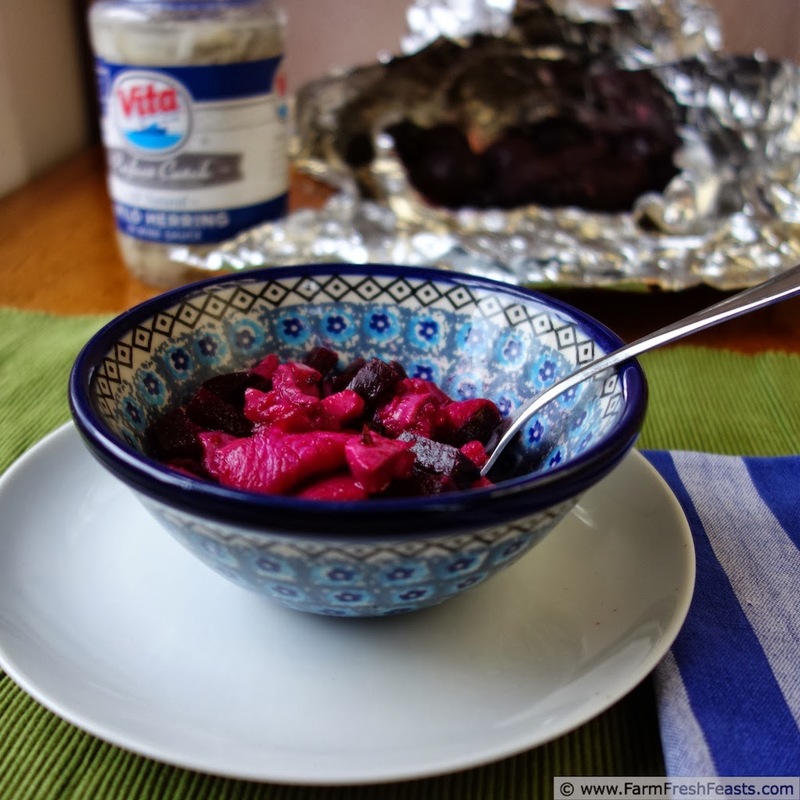 A quick side dish or simple lunch of roasted beets tossed with picked herring in wine sauce. Two ingredients and a few minutes to throw it together and you have a vibrant bowl of flavor. You didn't think I'd let a Valentine's day go by without beets, did you? Even though this is a food blog, I do other things besides cook to show my love. Earlier this week I showed my love for my spouse by cleaning out the refrigerator. True, I did get a side bonus by having a clean refrigerator, free of unknown items science experiments moldering about in the back. But, if left to my own devices, I would have spent that time working on a different project. I chose to show love instead. Last year, while writing about the holiday of love, I encouraged you to show your love to your family and friends by preparing a pizza for vegans, vegetarians, or omnivores. On Monday, I asked you to show your love to hungry children you'll never meet by donating $10 to #feedsouthafrica. If you didn't have a chance to donate, you can still do so here. We're more than halfway to our goal of providing 100 kids lunch for an entire year, and if each of the participating food bloggers could get just one reader to donate--we'd be there! Today, I want to talk about showing love to yourself. 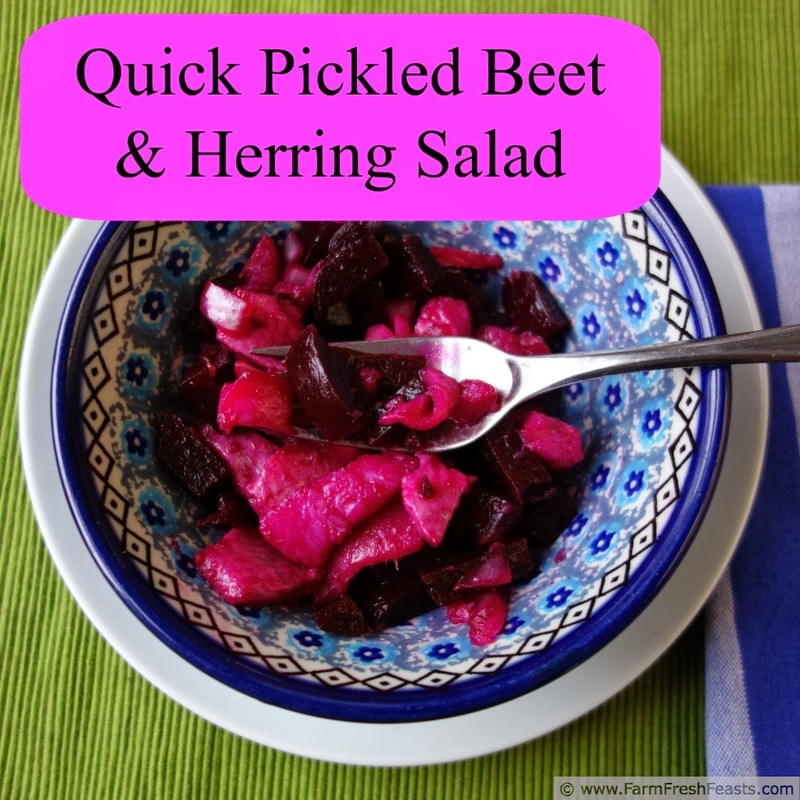 I am the only one in my household who likes pickled herring and pickled beets. Sure, my family will eat the herring with me on Christmas Eve, and they eat beets in a variety of dishes, but they don't like it like I do. So I very rarely eat this, even though I enjoy it. This dish is one way I treat myself, perhaps a winter version of my Sautéed Beet Greens and Spring Onions with a fried egg. 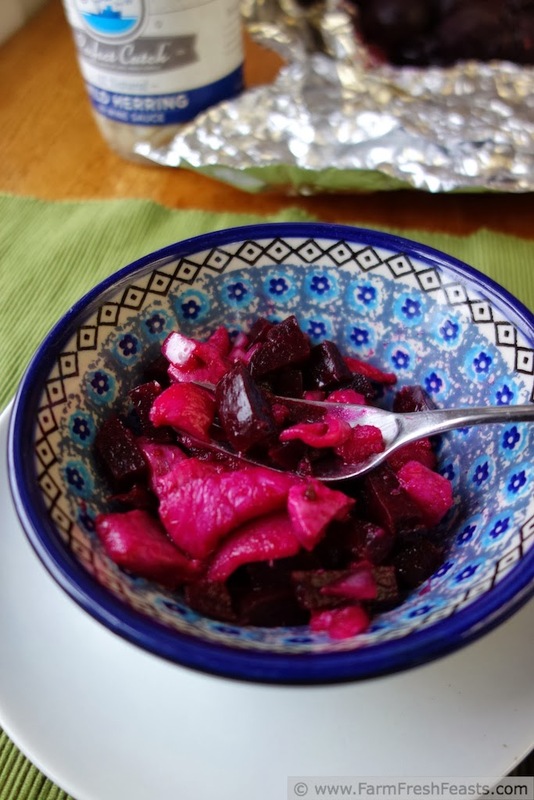 I can roast [technically, I'm oven steaming] a bunch of Community Supported Agriculture (CSA) farm share beets at once, freeze some for later use, and chop up one to make myself a bowl of this salad. I like to eat it for breakfast, lunch, or a snack. The rich red color delights me as much as the briny, tangy taste, and I thought it would be pretty for a Valentine's day recipe. If you've never tried pickled herring in wine sauce--only buy a teeny tiny jar to start, or get a bit at a deli counter. It's a taste I acquired after many years of starting our Christmas Eve smorgasbord glaring at the pieces of fish I'd been served, and daintily eating a bit of lettuce and some pickled onion while impatiently waiting to ditch the first plate and get to the good stuff--Swedish Meatballs. My palate and I have matured, though, and now I buy giant jars of pickled herring at Costco and I treat myself to the whole jar--one bowl at a time. For more recipes using beets, please see my Beet Recipes Collection. It's part of the Visual Recipe Index by Ingredient, a resource for folks like me eating seasonally from the farm share, the farmer's market, garden abundance and grocery store sales. For more recipe inspiration I'm pinning good stuff on Pinterest, follow me there. I'm sharing articles that catch my eye on Facebook, follow me there. I'm showing a carefully curated peek behind the scenes on my Instagram feed, follow me there. Want to know How to Use This Blog? Chop roasted beet into bite sizes pieces. Place in a medium bowl. Stir in pickled herring and onion. 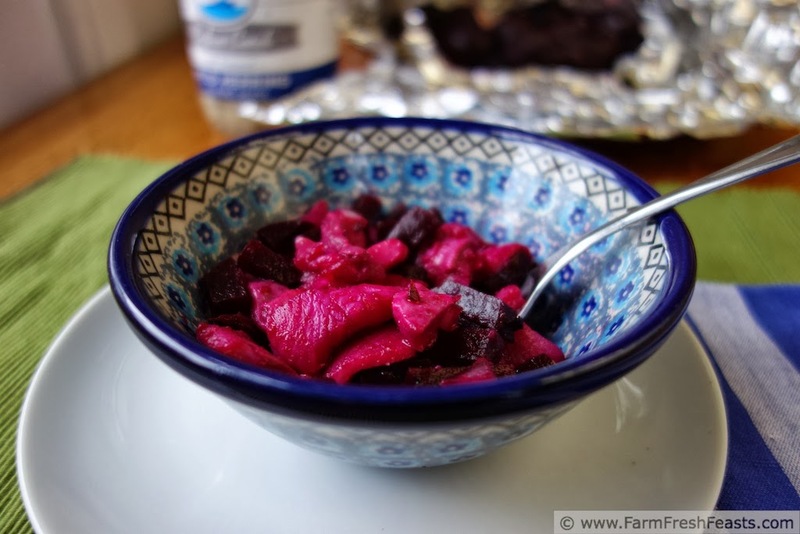 Let sit at room temperature for 20 minutes until beet is flavored with pickling juices from the herring. You are a good woman, cleaning out the fridge for your man. I'd marry you in a heartbeat if I wasn't already taken. How's that for love?! That's love. For sure. Happy Valentine's Day!